I love bobbins. Any shape, any size, any color, made of any material. I even use gift cards that have nothing left on them and cut my own custom bobbins. 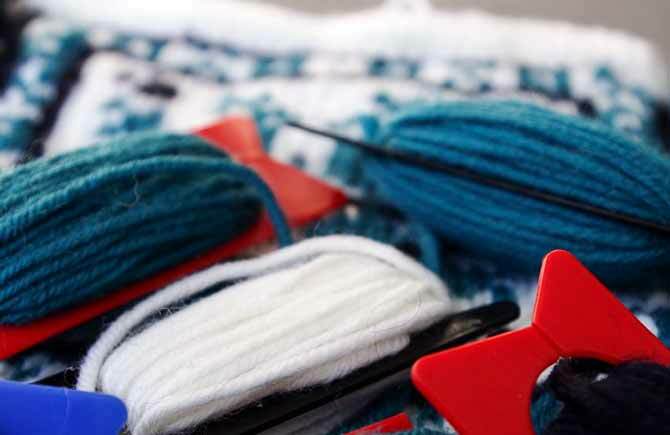 For color work, they’re an essential tool that should be in every knitter’s toolkit. Even though I have several different brands in my collection Unique yarn bobbins are very effective. One reason I like these Unique brand bobbins is their size. They are 2″ long and about ¾ʺ wide. The one end has two extended arms to hold yarn as you wrap it and the other end has a V-shaped indent and a slit at the bottom of the V through which the yarn glides to be caught in a semi-circular opening. As far as bobbin design goes, this design makes a lot of sense. As you wrap yarn around the center of it, a semi-circular mound of yarn does start forming. The plastic edges and the slit are all polished so there are no burrs and no place for your yarn to catch and tear, another characteristic that elevates this variety in my estimation. Side Note: Does it freak anyone out that my fingerprints are so easily visible on this bobbin? I think I’ve been watching too many criminology shows. I’m glad I’m not violent. I have sharp needles, but am too relaxed from knitting to react in that way when upset. I know, I know. I’ve seen those “beware, I have knitting needles” t-shirts that promise retribution for crimes of annoyances, too, but it’s just not me. When I knit the fairisle swatch (more about it tomorrow) that you see under the pile of bobbins, I was really pleased how these bobbins held the yarn in place (still using the yummy Dona yarn). I learned one thing, however. It’s possible to load up a bobbin too much. When I wrapped too much yarn around a bobbin, like the one with the teal yarn in the top middle of the picture, and I started to knit with it, there was too much pressure on the yarn to keep the live end from squeezing through the slit unbidden. Having a more reasonable amount of yarn wound around each bobbin made them more effective tools. They hung at the back of the work with a length of about 6″. I dropped the bobbin for one spin (the length of yarn wrapped around the core once before going through the slit) which added about 4″. Then I knit the row, twisted colors as needed across the wrong side so as not to have long floats. Once I arrived at the end of the row, it was a simple task to untwist the yarn from each other and let the bobbins hang directly down. Tomorrow we’ll explore some tips and tricks for knitting fair isle, a couple of them having to do with bobbins.